Legend of the Millennium Dragon DVD Review Hirotsugu Kawasaki, the man who wrote and directed ‘Legend,’ is best renowned for his past works Spriggan and Akira. Fans of those probably had the right to look forward to this- a historic setting, humans in a war with demons, a scroll artwork style and a moral battle- it has all the elements of a great OVA, but they just didn’t mesh this time. Watching ‘Legend of the Millennium Dragon’ is like being stuck inside one of those old Japanese scroll artworks- the ones that show dark caves, misty waterfalls and horned monsters. All colours are muted, giving it that antique look and feel. The human characters are simplistic and childlike in design, making them look like something out of a storybook. And the horned monsters are there, in the form of the ‘Oni,’ who are the demon antagonists from legend. 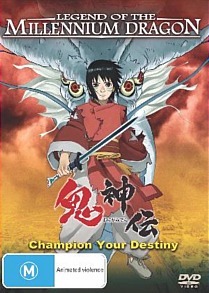 Modern schoolboy Jun encounters this lost world of feuding humans and demons when one of the Oni tracks him into his own time, and he takes refuge in a strange temple. Before he knows what’s happening he’s riding on horseback through the old Japanese capital, 1200 years in the past. The locals peg him as ‘the saviour,’ a boy who has the power to end the conflict with the Oni for good. But when he is captured by the Oni and taken to their camp, he is shown a different point of view- one in which humans are the aggressors, and Oni the guardians of the natural world. Pulled and prodded by both sides, he is drawn into the war and forced to make a choice- to support one side, the other, or neither. The biggest issue with ‘Legend’ is that it takes far too long to say anything meaningful. Even at 95 minutes it’s too long. For most of that time Jun is tortured by indecision, and I found myself just wishing he’d nick off back to the 21st century and let the two factions destroy each other. It’s very hard to engage or empathise with any of the characters, possibly because of the art style- faces are too simplistic to be able to show any subtlety of emotion. Even the battle scenes seem a little undercooked. There is some flashy action and the odd CGI effect thrown in, but it still plays out in a dull and plodding way. Most of the fights are accompanied by high-tempo grunge/rock tracks which seem totally out of place in this historic setting. The sound effects can mostly be described as pedestrian, with very little punch. Even the clop-clop of horses’ hooves sounds off. Hirotsugu Kawasaki, the man who wrote and directed ‘Legend,’ is best renowned for his past works Spriggan and Akira. Fans of those probably had the right to look forward to this- a historic setting, humans in a war with demons, a scroll artwork style and a moral battle- it has all the elements of a great OVA, but they just didn’t mesh this time.